It’s been a while! Time flies when you’re having fun. Anyway, I thought this would be a good topic to discuss because many people don’t really understand what residuals are and most people don’t make as much use of them as they could. Clearly they must be important. But what are they, and what do they tell us? Let’s take a step back for a moment and think about a simple problem so that the concepts become clearer. Suppose we had some physical process that we could observe and measure, and suppose that we wanted to understand that physical process well enough to predict what measurements we are likely to get in the future. 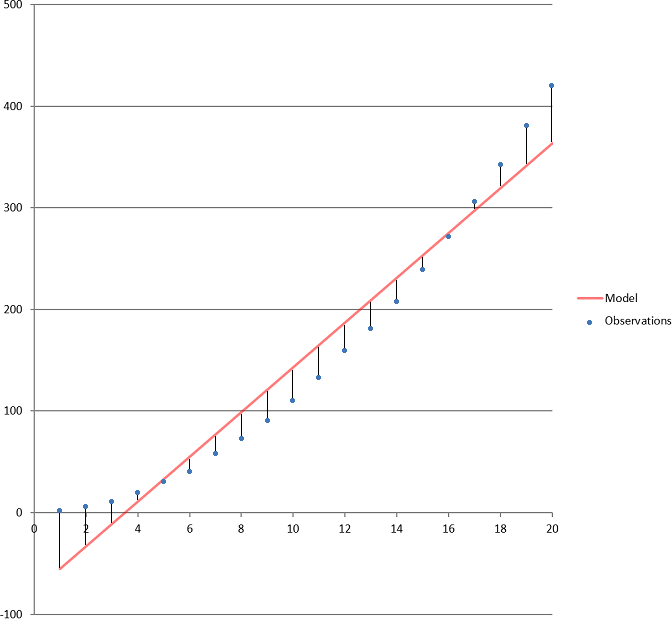 Now, many models have parameters that we can tune, so next we need to take some observations and try to fit the model to them — that is, determine the correct values for the various parameters in the model, preferably in a way that allows us to detect if the model is actually correct or not (i.e. whether our original belief was justified) and even whether the model is overly complicated (i.e. some of the parameters are redundant and can be removed). This is complicated slightly by the fact that real-world observations will have errors, and so therefore our model will never perfectly fit the data, even if the model is actually correct. The model we are going to try fitting in this case is a linear function of the form y = mx + b, where m and b are the parameters. This is convenient because not only is it simple to understand, Excel also includes a function to do the hard work for us, although it’s not hard to code it up by hand. To make things interesting, however, the spreadsheet will add random noise to the “true” Y values in order to simulate real-world observations with errors. The third column, “Error”, is the normally-distributed random error added to each observation. The magnitude of that error is controlled by the “sigma” value in M4. Increase sigma to make the observations more noisy, reduce it to make them more accurate. The fourth column, “Observed”, is what we actually see when we make the measurements. Note that we don’t know what the true value of Y is, and we don’t know what sigma is — all we know at this stage are the observations. We need modelling to derive both the true values of Y and an estimate of sigma. 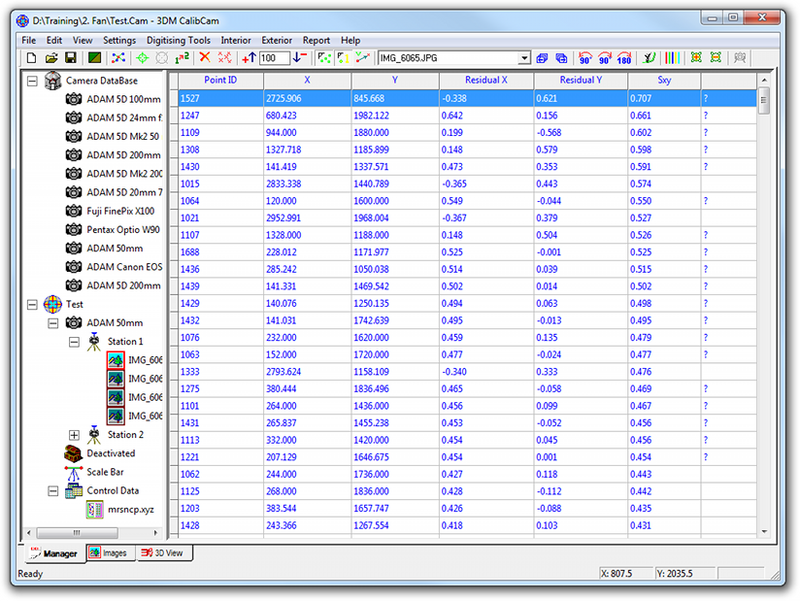 Under “Number of Samples” you can enter a value between 1 and 1000 and the spreadsheet will automatically generate that many observations for you. It’s a good idea to play with this because you’ll quickly discover that when the number of observations is low and the error is high, the parameter estimation for our model is not terribly good — this is why it’s a good idea to have lots of redundancy. Set N to 1000 and the estimates should become very good indeed. Under “Actual” you can set the actual, underlying process and, as mentioned above, the accuracy of the observations. Experiment with setting m, b, and sigma to any values you want. OK, so the Derived table shows what Excel thinks m and b are, while the Actual table shows what they really are. We can see how good the Derived values are by calculating, for each X, what we think the Y value should have been. That’s what the Derived column is, column E in the spreadsheet. That column is using our model to predict what the true value of Y should be, without the observation error. If we then compare the observed value with the derived value, we get column F — the Residual! 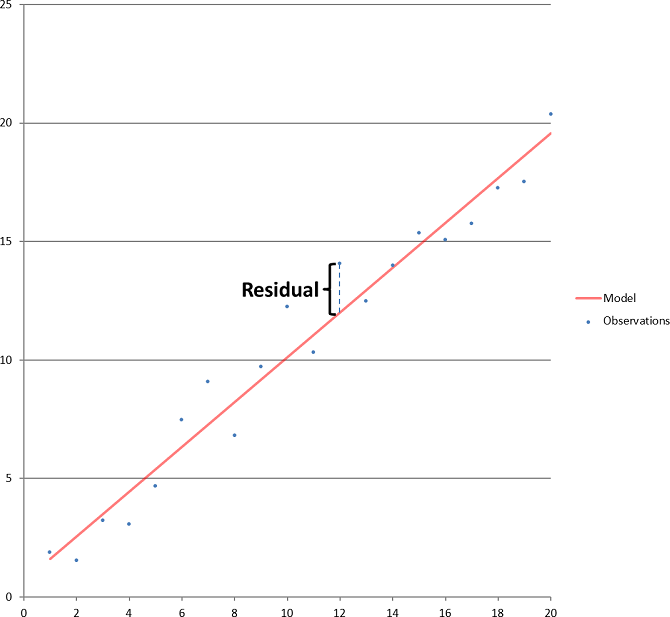 So, the residual is nothing more than the difference between what our model predicts a particular observation should be and what we actually observed. In the graph, it’s the vertical difference between the blue dot of a particular observation and the red line. LINEST finds the values for m and b that minimises the sum of the squares of the residuals — that is, if you squared each residual, and added them all up, then any other value you cared to try for m and b would result in a larger number. Well, suppose that we got the model itself correct, and we estimated the parameters of that model correctly. That means that the residuals themselves are exactly the same as the error we added to the true values to determine the observations! Which means that if we compute the standard error, or RMS (Root-Mean-Squared) of the residuals, we are actually calculating the magnitude of the observational error! This is what the RMS field of the Derived table is doing. 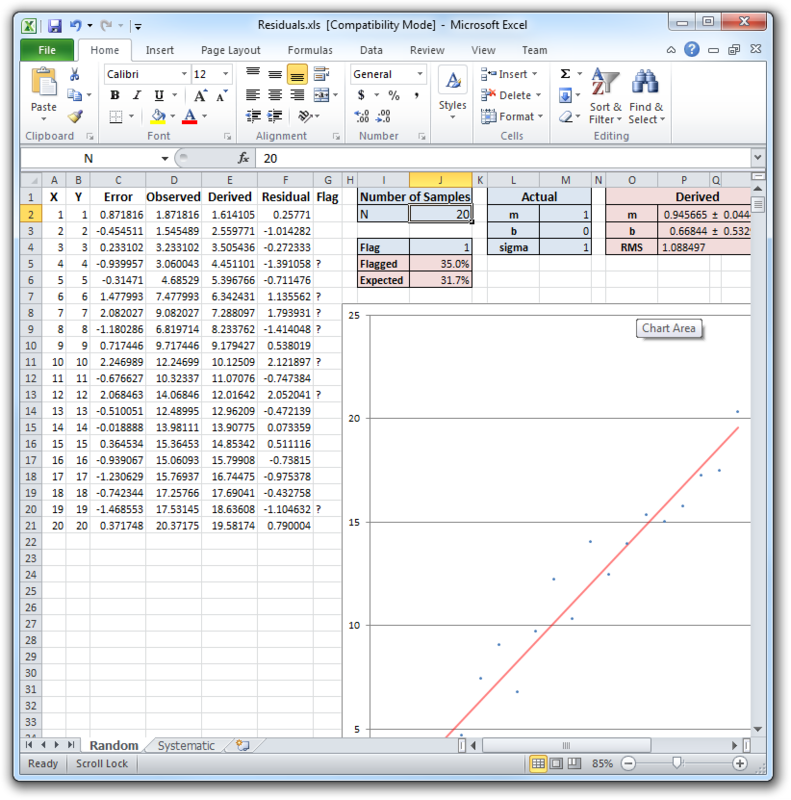 Provided there are enough observations, the RMS value should be almost the same as the sigma value, because in this particular spreadsheet we have got the model correct (by construction) and we are estimating the parameters optimally (using a least squares best fit, which is what Excel is doing internally). The next entry in the Flag table is the percentage of observations that were flagged using that particular flag setting. What about three standard deviations? That turns out to be about 0.3% of observations, or three per thousand observations can “legitimately” have errors larger than 3 × sigma. More on that shortly. How is this useful? Well, if an observation has a large enough residual in terms of number-of-standard-deviations, we can conclude that it’s sufficiently unlikely to have occurred purely by chance that it must be a “blunder”, as opposed to normal observation error. Why? Because either a gross error was made, or our model of the observation errors is wrong, and we have really good reasons for assuming a normal distribution for random observation error (see “Central Limit Theorem” for why). So what could cause this? 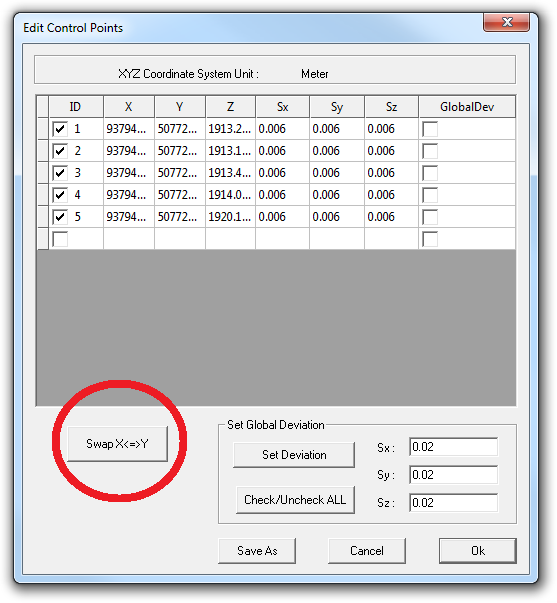 If it’s in the surveyed ground co-ordinates, it could be an instrument error, operator error, or software user error where the point was mis-identified. I once did a trial where three of the 15 control points supplied were “blunders”, one of them 2 km away from where it was supposed to be! That one turned out to be a fit of dyslexia on the part of the surveyor, transposing two digits in the co-ordinates when transferring it to the PC by hand. For relative-only points, it’s most likely to be a mismatched point. 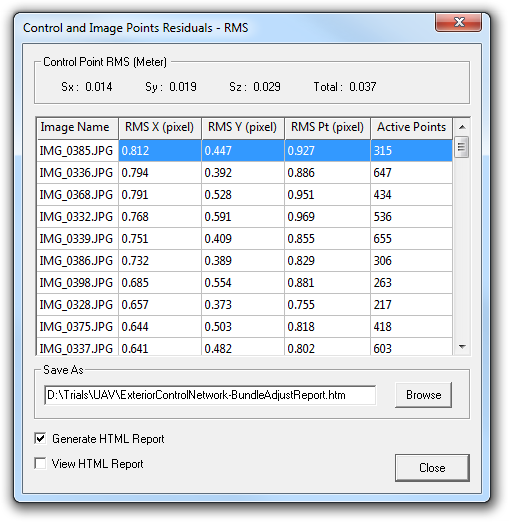 In fact, the menu Edit | Remove Bad Relative-Only Points looks at each image in turn, derives the average RMS for that image, and then removes any points with residuals more than three times greater than that, on the basis that such an error is pretty unlikely if the point only has random error. So, looking at residuals and comparing them to the RMS allows us to quickly identify points that are likely to be blunders. It’s important to get rid of those points because one of the guarantees that the bundle adjustment makes — that the result is the optimal one — only holds true if the observation errors are normally distributed. Blunders cause the residuals to have fatter tails than they should — i.e. the distribution of residuals is not perfectly normal. Think about that off-by-2-km control point — given a survey accuracy of 0.1 m, that represents an error of 20,000 × sigma — something that should simply never happen. And yet it did. So we need to filter out those points if we are to obtain the optimal results. You can test the “blunder detector” by manually overwriting a value in the Observations column with something absurd. Provided there aren’t too many of them relative to the overall number of observations, and Flag is set to a reasonable value (like 3), it should reliably detect your bad observations (and, despite my warnings, should not have too great an impact on the derived m and b values unless N is small). What else can residuals tell us? Apart from blunders, there is one other way that residuals can be non-normally distributed. What if the model is actually wrong? In our spreadsheet we used a simple linear function. If, instead, we used a quadratic to generate the values but continued to use a linear function to model the values, the residuals would not only contain random errors — they’d contain systematic errors as well! So how do we recognise when this is occurring? There are two ways. Firstly, the residuals are large relative to the expected observational accuracy. (In the example figure below, the observed RMS is about 30 times larger than sigma. 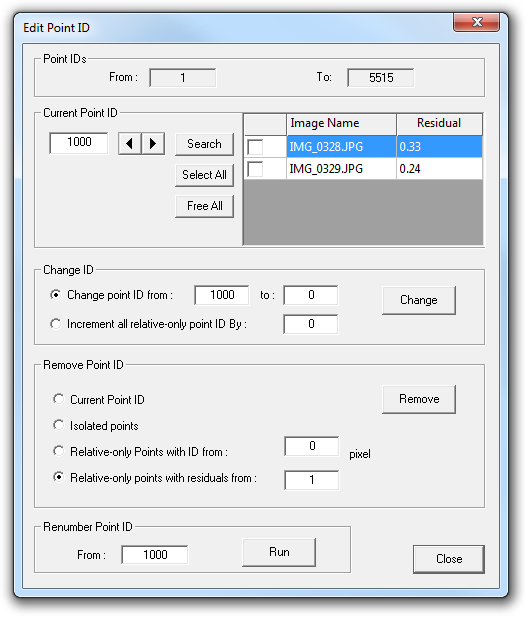 Increase the number of points beyond 20 and the observed RMS becomes truly enormous due to the effect of the x2 term.) 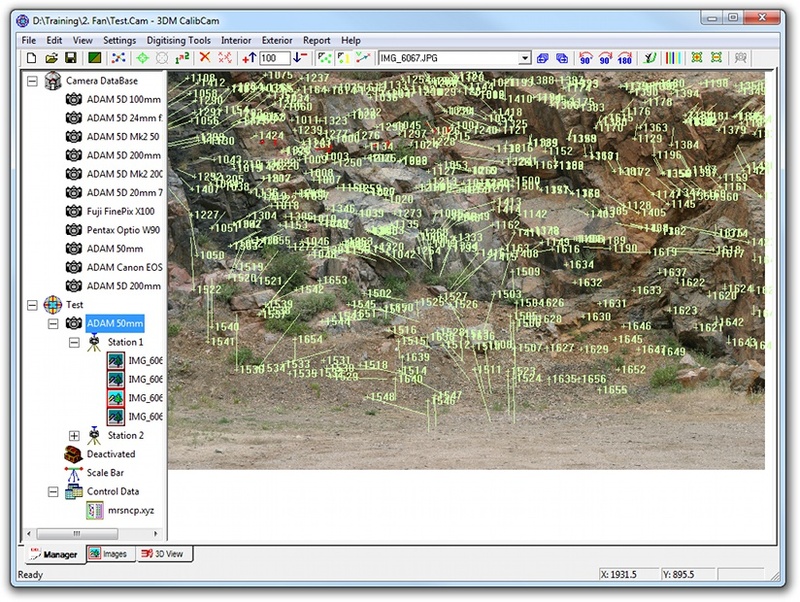 For image co-ordinate residuals, the expected accuracy is the image sigma that we determined during calibration. 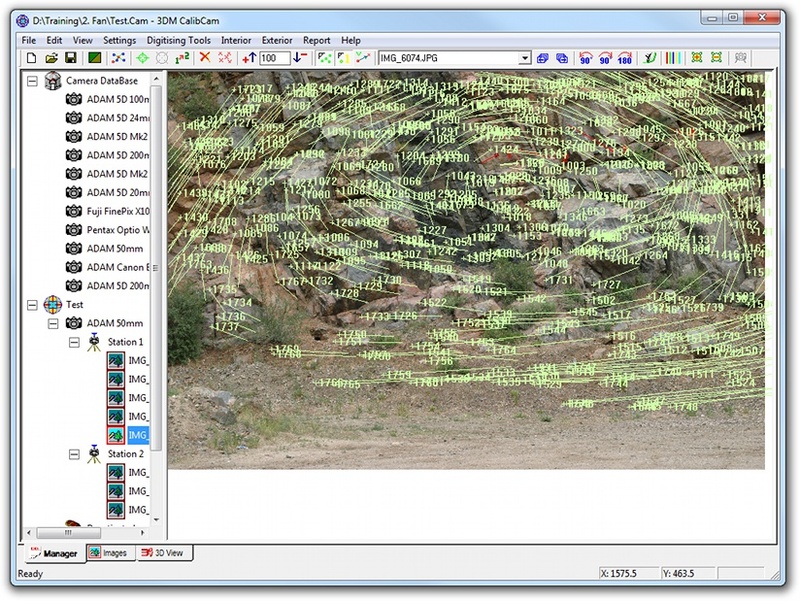 For control point residuals, the expected accuracy is the surveyor-supplied accuracy. If the model is wrong, the RMS’s of the residuals will not be consistent with what we expected — generally much higher. Secondly, you will normally find a pattern to the residuals. Look at the Excel graph again — notice how nearby points have very similar residuals, both in magnitude and direction? There is a lot of correlation between nearby residuals — this is a key indicator of a systematic error. By contrast, when we are dealing with purely random error, the neighbouring residuals are uncorrelated. Note that there is nothing to stop us from using a quadratic function as our model and attempting to use LINEST to determine the best parameters for that model — the term “linear” in the phrase “linear regression” (which is what we’re using) does not refer to the model, which just happened to be linear in the first example, but rather that our best fit is a linear function of the input data. For example, ax2 + bx + c is a linear function of x2 and x with parameters a, b, and c.
OK, so hopefully we now have a better idea of what residuals actually are, and also understand how we can use them to (a) detect blunders and (b) detect systematic errors (i.e. an incorrect model). It’s time to start thinking about how this applies to our software in concrete terms. What is the model? Your first answer would probably be “the camera calibration”, and you’d be right, that is one of them — when we calibrate a camera, we are implicitly assuming that the real-world camera’s behaviour is accurately characterised by the software’s internal model of a camera, and there are several ways in which that model could be wrong. 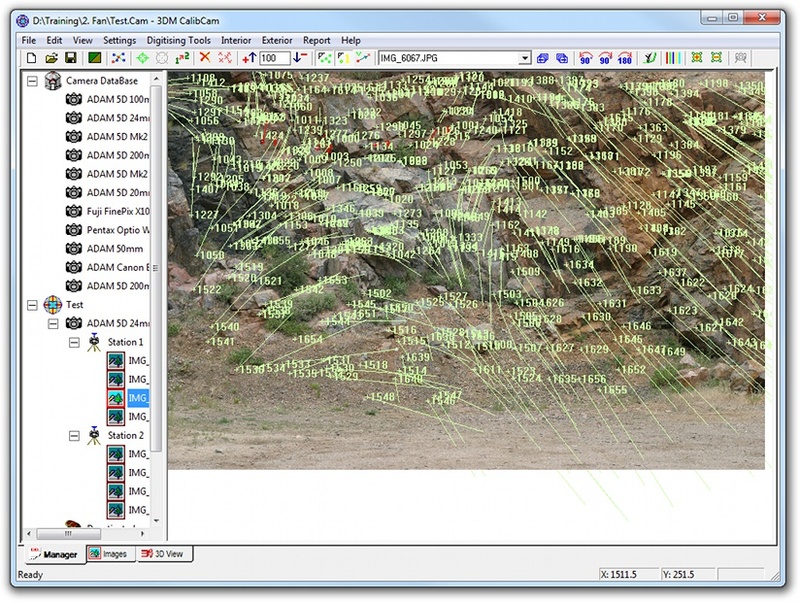 But there are other models as well — for example, if you place multiple images on the same camera station, and tell the software that the camera station is a “No Offset” camera station, then you are invoking a model that says each of those images has a common perspective centre, and that can be wrong as well! So let’s look at each of the things in the real world that can invalidate the various models that the software uses, and how we might detect those. Mixing up the camera calibrations and choosing the wrong one for the project. This will normally present itself as large residuals with strong correlation between neighbouring points, often with residuals pointing towards or away from the centre of the image because the focal length and the radial lens distortion corrections will be wrong, or swirly patterns if camera stations are being used. A slight variation on #2 and #3 that I have done myself — use the “correct” camera calibration, and use a panoramic camera mount, but forget to turn off the auto-focus when capturing images. The problem is that the auto-focus isn’t perfect, and if you press it multiple times you’ll see that it actually changes focus slightly each time. 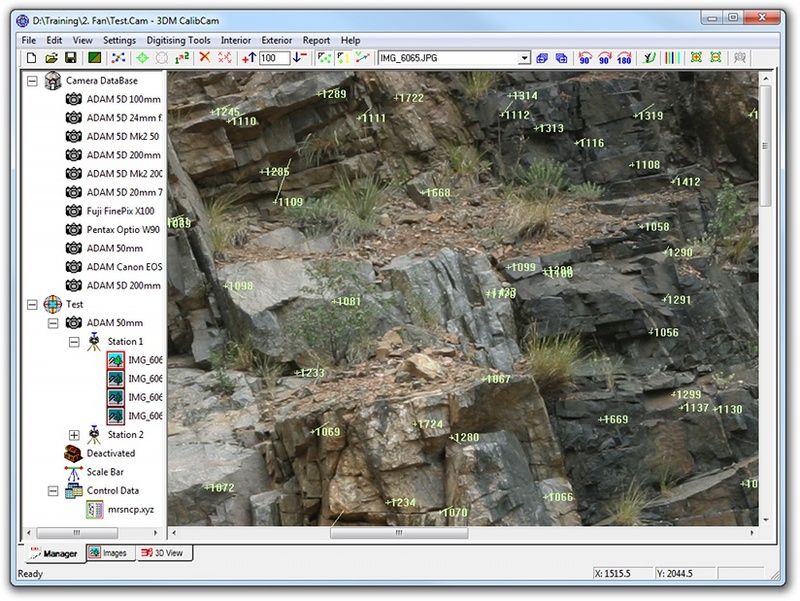 Using it for the first image is OK — recommended, even — because the slight error it might introduce can be compensated for by the exterior orientation (provided you aren’t surveying camera positions) but then it should be switched off for the remaining images because the slight changes do actually show up as residuals in the overlap area similar to #3 (although usually much smaller in magnitude). Whew! If you’ve made it this far then I hope you have a far better appreciation for the value of residuals and a much better idea of how you can use them in practice to detect problems and solve them. I strongly recommend taking a good, working project, and deliberately introducing the various forms of errors I’ve identified above to see what the effect is — change a control point’s value, for example, or the focal length in the camera calibration, or use a different calibration altogether, or manually digitise some bad relative-only points. One final note I’d like to make is this: when starting a camera calibration project for a new camera, of course the model is wrong! The parameters haven’t been determined yet — that’s why you’re calibrating it! So expect large residuals with systematic errors in them until you have actually performed the Interior Orientation. Be very wary of removing “bad” relative-only points, either by hand or automatically, because perfectly “good” points will have high residuals simply because the model is wrong. This entry was posted on 16th April, 2012, 6:20 pm and is filed under FAQs, Tips. You can follow any responses to this entry through RSS 2.0. Both comments and pings are currently closed.